Hot process soap is a fantastic method to create homemade soap from scratch. Similar to cold process soaping in many ways, hot process involves “cooking” the soap which speeds up the saponification process. 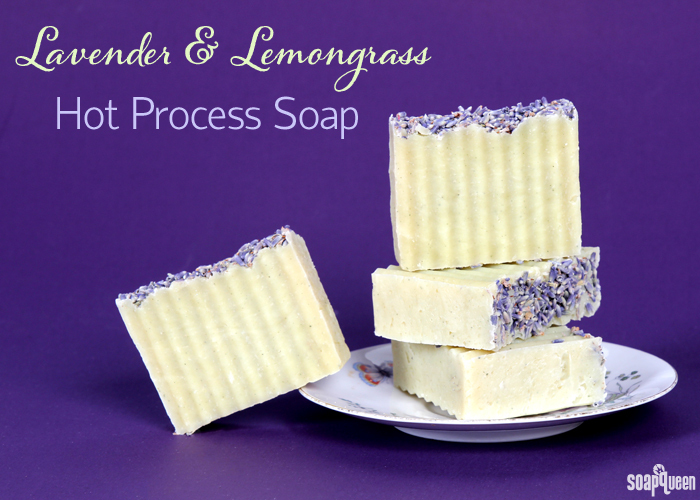 In this Soap Queen TV video, I demonstrate how to create natural Lavender & Lemongrass Hot Process Soap in the crock pot. The extra heat cuts down dramatically on wait time! Hot process soap is ready to unmold within 24 hours, and does not require the 4-6 week cure time. Personally, I still like to allow my hot process soaps to cure for about 2 weeks to allow excess water to evaporate and create a harder bar. This hot process recipe uses a combination of Lavender 40/42 Essential Oil and Lemongrass Essential Oil for a blend that’s both fresh and calming. The light green color is created with green zeolite clay and spirulina powder. 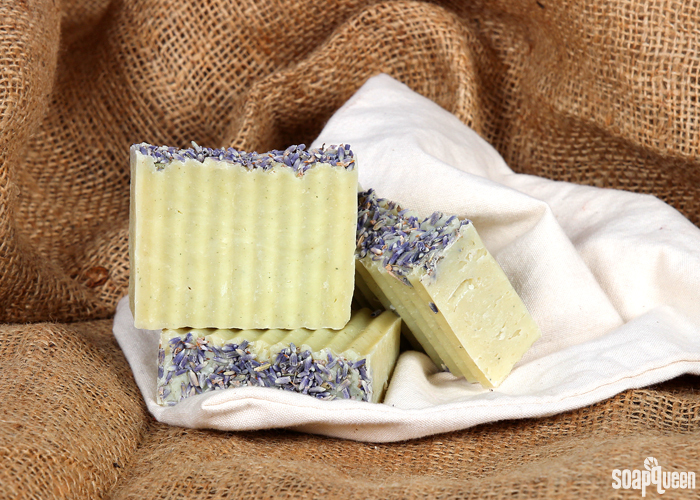 Lavender buds are added to the top of the soap for a chic and rustic look. For a charming finishing touch, I used a crinkle cutter. To help avoid drag marks from the lavender buds, I recommend flipping the loaf upside down and cutting from the bottom. Have you made hot process soap before? I love to use the hot process method when I need my soap quickly! Would using French green clay work the same as Zeolite Clay? Yes, French green clay will work well in this recipe. You can add it the same way as the zeolite clay. They are slightly different shades, so your bars will look different than the ones pictures above. Hi, thank you for this wonderful recipe. I totally got hooked on soapmaking after watching your YouTube video a while ago and now I’m looking forward to making my first batch of soap. To be honest, I would love to try this recipe… but considering how limited my experience is with soapmaking, I’m going to follow your basic and gentle cold process soap recipe 😀 If I want to scent my soap with lavender and lemongrass essential oils so that it will smell like this one, would you please tell me how much lavender and lemongrass essential oils should be added to the basic recipe? Thank you in advance. You’re welcome, glad you’re enjoying the recipe! The lavender buds will fall off the soap as you use it. To help them stick a little longer, sprinkle on a handful and then press them in firmly. Make sure to wear gloves as the soap is pretty hot. I an allergic to nuts so was wondering if the sweet almond oil in the soap would cause a reaction? I know when I ingest nuts I break out but never thought about it in soaps. I was wondering if I could use BB liquid green oxide instead of the spirulina powder? If so, how much for this recipe? TIA! I used your video for the recipe amounts, I had to throw our the batch because I added too much almond oil. The second try worked better but I found it hard to mix the colorants into the batch, it was very thick. I ended up with a brownish, dark greenish color that didnt get mixed in very well. Mine did not look anything close to your picture. Do you have any recommendations, could I add a little water if this happens again? Thank you!! Absolutely. How long did you cook the soap for? It may be the cook time – if it’s under cooked, it will have hard chunks that still need to be mixed in. If it’s overcooked, it may start to get dry and flaky. The best time to add colors is when it’s the consistency of mashed potatoes and has a gel-like appearance. If you find it’s a bit too thick, you can add a bit more distilled water to loosen it up. Hi! I am new to soap making. Two questions about the recipe. The ingredients says 6.9oz of distilled water. Is that in total, or just for making the lye water? If I was to omit the spirulina powder and zeolite clay, should I then decrease the distilled water by 2Tbsp? And when I mix in the essential oils can I mix the lavender buds into the soap? I like the idea of having them dispersed throughout the soap rather than on top. The 6.9 oz. is just for the lye water, it doesn’t count for the clay. So, if you skip the colorants, you don’t need to adjust the recipe at all. Also, you can add lavender buds to the soap. They do turn brown in the soap, so that’s something to keep in mind. They’re still fine to use, it’s just an aesthetic issue. I used a the 9 cavity silicon mold for this recipe and when the soap pops out of the mold it looks like there are air spaces throughout — almost as if I didn’t pack the soap down enough. Once done cooking, it was the same consistency as mashed potatoes – is there a way to get all the air out? I did tap it and shake it a bit but perhaps a loaf mold is better for the hot process. Do you have any tips for this? Hot process soap is pretty thick, so it tends to get more air trapped inside than cold process. To get rid of those pockets, place your mold on a hard surface like a cutting board. As you’re filling the cavities, firmly tap the cutting board with the mold on top several times throughout the process to settle it. The cutting board will allow you to get a bit more impact with the tapping and it will settle all the cavities at once. Thank you for informative tutorial. I was wondering about the usage rate of Essential oils in hot process and cold process. HP is less harsh for essential oils rather than CP, but here seems the same usage rate for HP is considered. The bramble berry Fragrance Calc also have option for cp and liquid not for HP. Would you please make it clear for me? I am sure somewhere in your website you have covered this topic (adding essential oils and usage rate for different products) but I can not find those pages. that would be great if you mention the links. Hello. Is there a printable recipe for this soap? Is there any oil I can substitute with Avocado Butter? I have just about every other oil other than that! I’m in a pinch and need to make this batch by this weekend and do not want to wait some days for ordering and shipping online. Send help! While cold process is my preferred soap because designs/patterns are virtually unlimited, I do love hot process and recommend it if you have not tried it. My favorite way is to take cold process soap (any color scheme you want) , cube it (small cubes) and add it to the hot process at the end, just prior to molding. It makes a great looking bar! Another thing I love about hot process is the superfat. My recipe calls for 5%, but it has a high coconut oil percent so I like a higher superfat. Once the soap is cooked and ready to mold, it is soap with no lye so this is a great opportunity to add your extra superfat. I usually add castor oil (no more than 1 to 1.5 oz for my recipe), stir it well and mold and I have an awesome bar of hot process soap. Another great thing is no glycerine rivers and no soda ash! I just made some one week ago and am going to try one this weekend. See it on youtube.com under theorgelmeister. Hello I am looking to try this recipe, but I have a question. What size crock pot should I use? Thanks again for all that the team at brambleberry do! You guys rock! Can another oil be used as a substitute for Palm Oil? Thank you so much. I have the soap crafting book and looked up hot process but didn’t have insulation info in it. You are all wonderful. one more question does this soap need to be insulated for 24hrs or just covered with cling film and left to rest? I’m using the silicone loaf mould 50 oz one. I’ve recalculated the lye but with the Spirulina and Zeolite clay should I use 1.5 tsp in 1.5 tbsp of oil and water respectively? Hello! I made this recipe a few weeks ago and it was a pretty green. As is cures, it’s turning a mossy, almost brown green. I used all the same ingredients. Could this be due to the olive oil used? Any suggestions? Thanks ! Love the site! Also, my lavender buds are falling off everywhere and turning brown! As the soap cures, the spirulina can fade slightly. However, we didn’t notice any browning with the recipe. Did you make any recipe substitutions at all? Also, lavender buds are a natural ingredient, so they do turn brown over time. That is normal with natural ingredients like lavender buds and rose petals. Let me know and I’ll help you troubleshoot! Probably a really silly question but make a mistake and money down the drain!!! So the butters and waxes come in solid form and need to be melted down. My question is, the amount of oz needed is that in solid form or liquid form? Thanks Kelsey – also can I use the 10″ silicone loaf mould – I know this holds more soap but was thinking i could multiply ingredients by 1.5 to fit this mould? Could this recipe be used in cold pressed method? I just topped a CP soap with lavender buds and there was a lot of discoloring around them. Is this what usually happens or could there be another explanation, like using old buds, only sprinkling them on instead of putting a solid base that would cover any discoloration on the soap, etc. Also, would adding lavender buds into the soap base at trace also cause browning? That is normal with natural products like lavender. Eventually, they will all turn brown. There can be a bit of mold growth on the plants as well. That’s something to keep in mind when using fresh products! Hi, I love your site, but I haven’t done any recipe yet. it’s because i’ quite beginner in cold process soaps and i don’t want to do these big amounts and second, i’m from Europe and it’s hard to convert it in kg. Also, you can figure out the percentages using our Lye Calculator! Just enter the oil amounts, select a 5% superfat and hit “Calculate.” It will show the percentages of each oil next to the ounce amounts. It does sound like the rose geranium essential oil is causing some ricing in your cold process soap. My guess is that the reason why it does not cause ricing in your hot process soap, is because by the time you add fragrance to hot process, the soap has gone through more of the saponification process than cold process. Therefore, the soap does not contain as much active lye for the essential oil to react with. I’m new to hot process and plan on making this soon, but the video and the ingredients list above have different amounts for the sweet almond oil. Is it 12.1oz or 2.1oz. Thanks. Is there something else I could put on the top of my soap? I don’t like the mess that lavender buds make! Thanks! I really need to give this a try. Great tutorial! I have just started making HP soap (having made CP for some time). I really like it as I don’t have to worry about partial gel or acceleration, which is much more relaxing 🙂 . Plus I find it less messy for some reason :). Kelsey from the team has answered so many of my questions re hot process soaping over the past few weeks. I am very grateful for the support you guys provide!